Please link your reviews for your Classic with a Color in the Title here. This is only for the Classic with a Color in the Title category. Examples include The Woman in White, Anne of Green Gables, The Red and the Black, etc. (Silver, gold, etc. also count). If you do not have a blog, or somewhere public on the internet where you post book reviews, please write your mini-review/thoughts in the comments section. If you like, you can include the name of your blog and/or the title of the book in your link, like this: "Karen K. @ Books and Chocolate (The Black Tulip)." The Woman in White was the first book I have read by Wilkie Collins. I thoroughly enjoyed the convoluted plot, the method that Collins used to advance the plot, and the outstanding character development. I look forward to reading The Moonstone. Wilkie Collins is wonderful. I also enjoyed Armadale and No Name (Armadale has an especially convoluted plot, with four different characters named Armadale!) If you like Victorian sensation novels, I also recommend Mary Elizabeth Braddon, she wrote a ton of novels which are mostly out of print but easy to get free on Gutenberg and ibooks. I liked Moonstone more than The Woman in White. I read Agatha Christie's The Man in the Brown Suit - I love Christie, but this isn't one of my favorites. Not a Miss Marple; not a Poirot. The story is told by a young woman with excerpts from an older man's journal. I didn't care for the writing style. If I see a Virago book in a used book store I buy it. 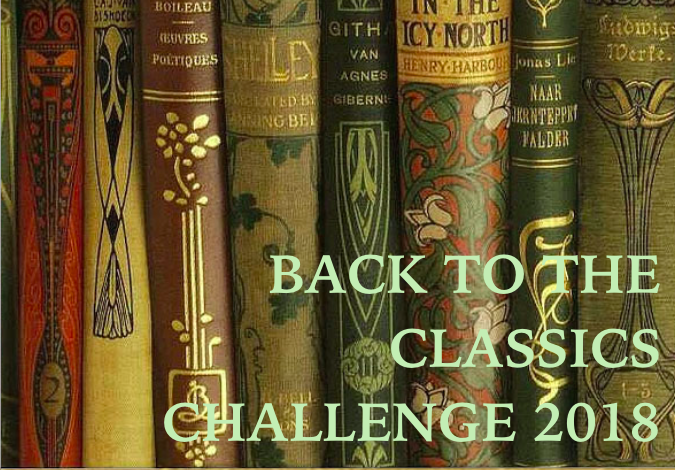 So I had owned Red Pottage for years until the classics challenge caused me to read it. I enjoyed it greatly and can imagine why it sold well in 1899. It's a `new woman' book which is both powerfully disruptive and witty. I grew up in a small town in England so some of the satire about the Anglican church and the social hierarchy rang very true. A very good read. I know what you mean about the Viragos -- I'm always drawn to the green spines in used bookshops. I loved Red Pottage and was half wishing I had saved it for the challenge this year, it was one of my favorite reads in 2017. I read The Chinese Orange Mystery by Ellery Queen. It was...strange. I couldn't tell if it was ripping off Sherlock Holmes or making fun of it so I didn't know how to take it. I don't think I would read any more of the series. The Mystery of the Blue Train by Agatha Christie - To understand Agatha Christie you must understand that it is never the obvious person. "The Red House Mystery" by AA Milne (yes, THAT AA Milne!) His only mystery novel. I'd call it a cozy mystery with a lot of humorous banter between the amateur sleuths. Scarlet Pimpernel- it felt slightly sacrilegious that I had seen the movie and musical so many times and had never actually read the book. Read The Children of Green Knowe, a classic I'd never heard of until a few weeks ago... I was disappointed. I read A Study in Scarlet by Arthur Canon Doyle. I loved the Sherlock Holmes short stories when I was a kid and was glad to be able to read my first Sherlock Holmes novel. Also good that it was the very first Sherlock/Watson story in the long line of short stories/novels featuring the duo. Enjoyed and wondered if the writers of CSI and other forensics shows read these books. Sherlock was the original fictional forensics detective. I read The Woman in White, by Wilkie Collins. I liked it a leeeetle less than The Moonstone, but I still thouroughly enjoyed the read and am looking forward to reading more by Collins. I notice that scarlet seems to be a very popular colour, here. I read The Scarlet Letter, and in a way it reminds me of that Les Miserables song. "Red, the colour of desire! Black, the colour of despair!" I read The Little White Horse by Elizabeth Goudge. It was a wonderful and magical fairy tale. I greatly enjoyed the story! I found The Black Tulip suspenseful - once I got past a lot of the political machinations which didn't hold my interest. I reentered my link bc the one at #32 was not the right one. The one in #42 should lead to my review. Sorry! I did't know how to remove the link. 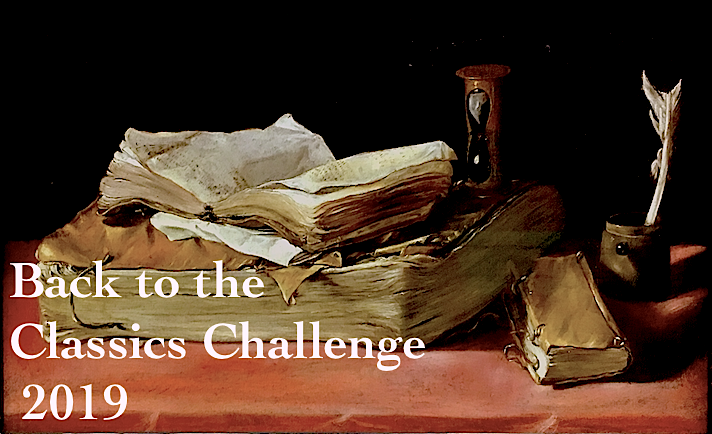 Just posted about The Black Arrow, which completes the challenge for me this year! Earliest I ever finished. 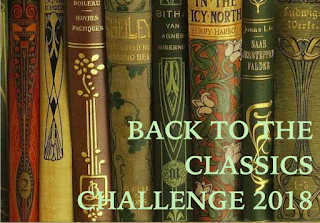 Just finished Dream of the Red Chamber and the 2018 Back to the Classics Challenge. Wrap up post in a few days. I looked it up, and there are peach colored (and named!) crayons, so I say it counts haha! Oops. I did not fully understand the system with single thematic link-ups before now. All I have written is thei one - colour in the title-rewiew. I'm not sure I'll ever make it this year, but it has made me think. I'll return next year. Just Finished Woman in White. Interesting book. I read Anne of Green Gables..I think it was my first time reading the unabridged book!